When I adopted my first dog Sailor, a rescue greyhound, my plan was to go for walks together and have him retire to the couch. Instead Sailor and I ended up competing in companion events. My dogs and I have been involved with canine drill teams. I have organized, led, choreographed routines and made music selections for both adult and 4-H drill teams. We like to visit the nuns at Notre Dame and have performed in “dog shows” for various nursing facilities. My adventure into dog events has led me to canine freestyle through Canine Freestyle Federation. CFF gives me a creative outlet I can share with my dogs. Training a dog is truly a journey. Success can be measured in both big and small ways. My dogs and I have competed and titled in obedience, rally, tracking, and agility. They have earned their CGC and have been TDI certified. 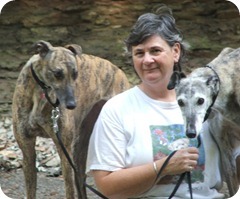 I continue to actively train and compete in multiple disciplines with my greyhounds, Pearl and Rain. My intent is to encourage dog and handler teams to try and enjoy whatever discipline they choose. It is a journey worth taking.